The Communion Veil: What is Your God "Relationship Status"? A) Single: I dunno, Atheist? If you are single, then you are alone and have no relationship with God or His Church..
B) In a Relationship: Ok, this is a little murky, in a relationship with whom? This could be a relationship with Buddha or your dog. Seems very non committal. This person seems to be on the fence. C) Engaged: Better, maybe someone who is going to Church, maybe even praying a little, seeking the Lord. You're on the right path. D) Married: This could be a Religious, or a person completely committed in their relationship to God to the point of death do us part. The person could also be of the married or single state, but either way, they take their relationship with God to a very serious and holy place, just like a marriage. E) It's Complicated: If it's complicated, I trust you it isn't complicated for God, only for us. The only reason it could be complicated is if we have had a hurt that has made us turn from God or we have sinned against God, damaging the relationship. (Our side of it only, if we are breathing, He still loves us). We feel the pain of our sin and turn from God, He never turns from us. We have to remember, God never has anything to repent for, but we do. 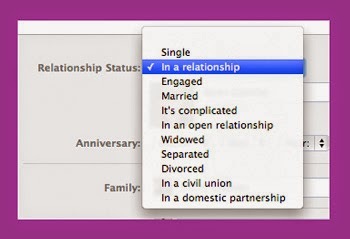 F) In An Open Relationship: This is scary. These are the people that go to Mass but then have an appointment with the psychic down the street. They go to confession to confess adultery but check their watch after their act of contrition to make sure they aren't late to meet their mistress. This is NOT an open relationship, it is a closed one. Closed because of their sin, they have closed their relationship with God, but said yes to someone much more terrifying. God doesn't allow straddling fences, either you are His or you are the evil one's. So many people think "no one sees", when God sees not only your action, but the motive of your heart! Do you really think you can give a 'nod' to God while you do what you want? You are playing with your eternal judgement. God is not mocked and the confessional is NOT fire insurance. G) Widowed: This is a religious or other committed 'married' person (see above) who has died inside to the faith they profess on the outside. They 'go through the motions' of the Holy Mass, or the Sacraments, or just being a lay person and serving at church, but inside they are dead to any true contrition, repentance or love. They have allowed legality, or hurts, or desire for control to kill anything that was truly of God inside them. They held on to these hurts, held them close to their heart until the Sacred Heart was blocked from renewing theirs. The love no one and continue in sacred rituals through which God still works, but they are dead to. Pray hard for them. H) Separated: We see this many times in the Church. Catholics, raised in the faith, perhaps even committed in the faith at some point but for some reason start to fall away either to the world or to Protestant Faiths. They may still come to Holy Mass occasionally, (Easter and Christmas Catholics!) for special occasions, but they have lost interest because they never really understood what was happening here. They may give a feigned smile to the Church, but their passing love notes to Martin Luther. I) Divorced: Any Catholic who was raised and once engaged in the faith that goes completely to another faith. They will speak ill of their Catholic faith and all Catholics, thus widening the gap of any hope for ecumenicism. They will openly encourage other people in the Catholic church to get 'divorced' also. These people love to tell how great being 'divorced' is. Being divorced from the Holy Mass and the most Blessed Sacrament sounds like the worst punishment anyone could suffer. J) Civil Union: This is a tough one, because it is like a marriage, but you marry your same 'type'? I don't' know....Catholics that become Episcopalians? To me I have the same reaction, you just want to say... "Why"? Great post. Makes things very clear. When my husband suddenly left me pregnant with our 5th little boy, I temporarily explored other Christian faiths. Some had great ideas, but no Eucharist. I missed so much of my Catholic faith and am now drawn to discover more. One of the most heartbreaking things for me was to talk to people at these churches and see how many people were in fact "divorced" Catholics - and how they wanted me to divorce my faith too. My heart hurt for them.